Normally I get excited to see a few flakes falling from the sky. The ground coated in a blanket of white snow is so pretty. This winter we have had a total of 54 inches (and rising) total accumulation of snow. The first snow storm gave us about 7 inches of snow. Then the snow blower broke and the entire family had to dig us out. After we dug out, the snow plow came along and blocked our driveway. We had to shovel again, especially around the mailbox. Our mail lady gets mad if she can't reach the mailbox. A few days later (after the 7 inches), another storm hit. We got an additional 10 inches on top of that! Once again, we dug out and the snow plow blocked our drive way in again. It was at least, a four foot wall of snow. The snowman the kids and I made from the first storm was covered up by the next. It took six of us to shovel out the cars. Lucky for us, Brandon's friends spent the night. We had a few extra hands to help us. Our neighbor came over and helped with his snowblower. Since then, we have had two more days of snowing. Another 8-9 inches. To my dear friend in Australia who thinks I am lucky to get snow. Kerry, I'd gladly trade places with you right now! In the same boat. Tired of it too. Good that you have a few strong backs for that shoveling. I'm not posting anymore snow related pictures. I don't want to give mother the nature the satisfaction. I have a feeling Mother Nature isn't done with us yet. I had to bribe with a lot of food! you just described my entire winter season. Yes, lets go trade places with Kerry for a few weeks! I hate it when the snowplow puts that big wall at the end of your driveway. 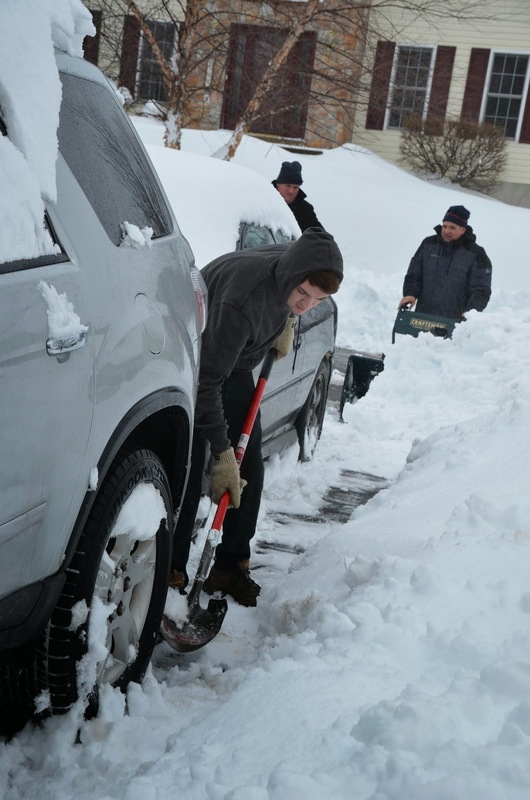 I was trapped out of my driveway one winter; 6 months pregnant and my toddler screaming like the hounds of hell were in there with him, hubby at work - and had to dig it out so I could get the van in the driveway. because it is against the law to park on the streets up here during the winter. I still say that day is why I have back pain still! !